This is something I’ve wanted to put together for a while, and I finally got around to it. Below is an illustration showing the Eagles’ 2012 performance, relative to long-term league averages, in a variety of statistics. The format is far from perfect. Ideally, I’d put this into a Tableau pop-out. Unfortunately, that software is not available for Mac. If someone has it and is interested in putting that together, please email me and I’ll give you the necessary data. For today, though, we’ve got two charts. I apologize for the small size, you might want to zoom. Just getting it in this format took about 5 times as long as actually putting the data together. I’ve standardized all the data using standard deviations and ordered it so that the left side is bad and the right side is good. Please note that not all of these statistics are necessarily normally distributed. However, this is the easiest way to get everything on one chart, which allows us to quickly identify where the team’s weaknesses and strengths were last season. Additionally, we can quickly identify the areas for which we can expect significant improvement purely as a result of mean reversion. In particular, you should focus on the stats for which the Eagles were more than two standard deviations WORSE than long-term league average. 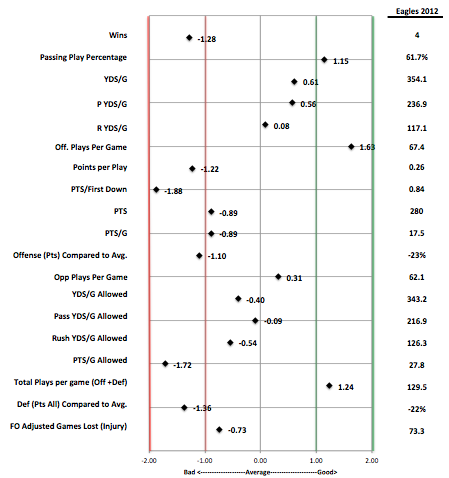 All averages and standard deviations were computed using 10 years of NFL data (except for Net Field Position and FO Adjusted Games Lost, which uses 5 years of data). 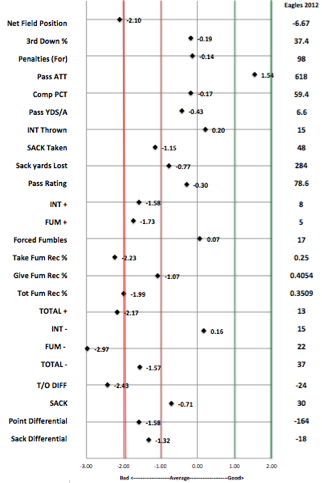 The right side of the chart shows you the actual statistical measure for the 2012 Eagles for each stat (i.e. Average Net Field Position was -6.67 yards). Eagles fans can expect significant improvement in each of these areas (obviously they’re all interrelated to a degree). This next chart isn’t as severe, but gives a good view of just how good/bad the Eagles’ performance was last season. Of particular note is the last one (bottom of the chart). That’s Football Outsiders’ measure of injury loss per team. It’s a weighted statistic that attempts to account for the relative importance of the players lost to injury as well as the overall number of games lost. The 2012 Eagles, while hit hard by injuries, are not outside the expected range. The concentration of injuries along the O-Line may mean that statistic underrates the degree to which injuries hurt the team, but the point remains, health is likely not an area in which to expect dramatic improvement (already losing Maclin already stopped much of that conversation anyway).